Home › What is Conditional Formatting? CONDITIONAL FORMATTING highlights the cells with a certain color, depending on the cell’s value. It allows you to distinguish those cells of a given criteria in the spreadsheet. Creates a data bar within the cell for a graphical representation of the values in a given range. Creates a color scale within the cell for a graphical representation of the values in a given range. Sets icons depending upon the values of the cells in a given range. You can modify your formatting by adding formula in CONDITIONAL FORMATTING. 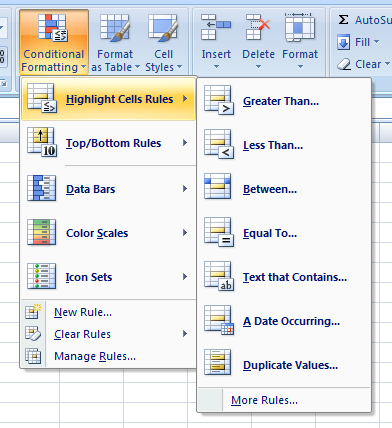 Click on Conditional Formatting>New Rule>Use a formula to determine which cells to format.